Talk about a great way to start the day! 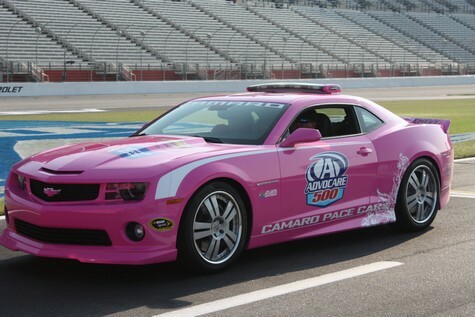 On a gorgeous summer morning, a truly spirited group of remarkable pink-clad women, who have all battled and survived breast cancer, gathered near Victory Lane along the front straightaway at Atlanta Motor Speedway to ride the track in specially marked “Making Strides Against Breast Cancer”-themed Chevrolet Camaro SS pace cars and Silverado pace trucks. 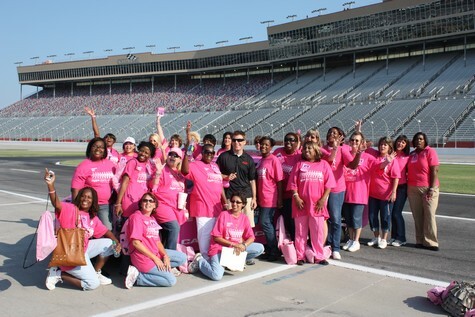 American Cancer Society and Chevrolet teamed up with Atlanta Motor Speedway to host an event to raise breast cancer awareness, and give survivors the thrill of a ride around the track with Team Chevy drivers Jamie McMurray, Ron Hornaday, and Clint Bowyer. The party had already started as these 30 amazing women arrived. They were all full of excitement and comments and questions like, “How fast can we go?” “Ok, you can sit in back, I’ve got the front!” and “Shotgun!” were flying around the group. These are ladies who know how to make a party out of just being together and doing something most of them would have never thought of doing before today. According to Anissa Johnson of the American Cancer society, the genesis of the idea for this event came from Chevrolet, who contacted Marcy Scott, Director of Marketing and Promotion at AMS, who called her. She blasted an email and the calls started pouring in…even from women who had never seen a race before. Two lovely ladies who went on the first rides of the day were Johnny Arnold, who is a seven year breast cancer survivor working on eight, and Helena Gibbs, aka Sunshine Butterfly, who will celebrate her seven year survival on October 15. From women who were not special NASCAR fans, they are now confirmed Jamie McMurray fans. Their life-affirming spirit and joy are completely contagious. All of the extraordinary women who attended have that. It’s a feeling of sisterhood, of a shared journey, that invigorates them and infects anyone with an open heart. It seemed natural to cheer each of the rides right along with them. Even those who were apprehensive about it at first seemed to have a great time. When asked if she enjoyed her ride-along, Gina Cook summed it up nicely, “I wasn’t afraid at all. If you can take on breast cancer, you can take on anything!” Gina is a singer who has self-produced her own CD “Life is Wonderful”, which some of her music will be featured on future shows on RubbingsRacing.com. She has a song called “Slow Down” which she says perfectly describes her life now, and goes perfectly with NASCAR. “I only slow down when I have to change my oil.” That pretty much describes her, too. Even the drivers got into the spirit of the day. 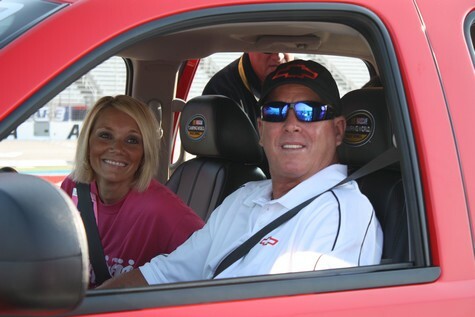 Ron Hornaday came in from one ride-along honking the horn and yelling, “She grabbed the wheel! I can’t believe she grabbed the wheel!” See, fearless women. 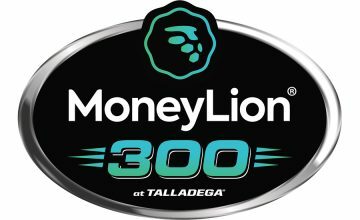 Jamie McMurray said that it was a pleasure to do ride-alongs with such an enthusiastic bunch. He mentioned that a lot of times he can’t tell if the rider is having fun. He didn’t have that problem today. Clint Bowyer felt it was an honor to be in the presence of so much positive energy. 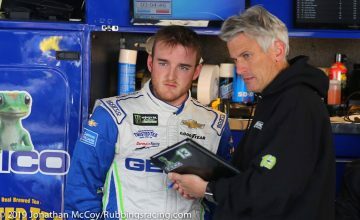 Of course, in true Ron Hornaday fashion, he had to have the last word. As he was leaving, he left a chorus of laughter in his wake with his parting shot, “Hope you enjoyed it. If I scared the pee-pee out of you, the restroom is over there!” Thanks for the rides, guys. Great job! 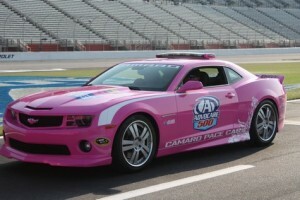 Thanks are also due to the wonderful folks at Atlanta Motor Speedway, especially the marvelous Marcy Scott. The American Cancer Society is holding a walk in Centennial Olympic Park Saturday, October 29, 2011. You can sign up today to help end breast cancer at: www.stridesatlanta.org. A huge thanks to the great people at Team Chevy. Thanks for a truly happy experience, and not just for the survivors. You lifted a lot of people’s spirits with this event. 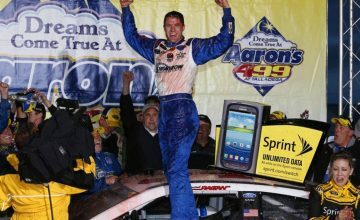 Be sure to follow Lisa DeSpain on Twitter, @LisaDespain, for more NASCAR news and updates!